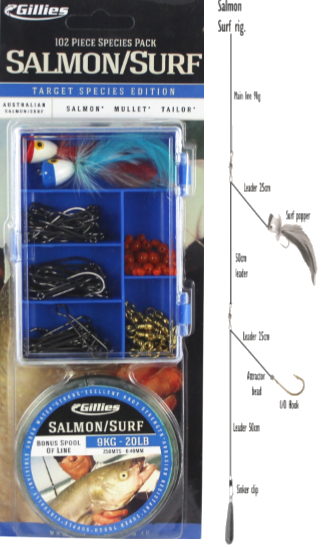 Category: TACKLE PACKS, TERMINAL TACKLE, SPECIES TACKLE PACKS. When going surf fishing it’s important to have the correct tackle. The Gillies Salmon surf pack contains various pieces of tackle including hooks, swivels, sinker clips, attractor beads and surf poppers packed in a tackle box. Also included is a bonus reel fill spool of line in a foam green colour.